The game of the leader of the tournament Wang Hao (China) against Sergey Karjakin (Rus) was interesting and unpredictable. Wang, who had the black pieces, played like a man: he sacrificed a knight and refused to make a draw in the middlegame. Finally, he was awarded for his courage: Sergey blundered in a winning position. After this win the leading Chinese player has 5 points out of 6, a great result for a strong tournament but he is not yet the definite winner. 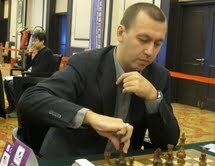 In the last round he will play against Gata Kamsky (USA), who defeated Ruslan Ponomariov. Wang Hao only needs a draw to ensure first place. It is also worthwhile to mention that Vugar Gashimov (AZE) defeated Vassily Ivanchuk and he and Kamsky are both 1 point behind the leader.